The KOHLER touchless toilet is the no-touch flush for your home. Just hold your hand over the tank sensor to activate the flush. No handle to touch means fewer germs to pick up or leave behind. This Cimarron tank features innovative AquaPiston technology, a patented flush engine that delivers a fast, powerful, and virtually plug-free flush. Its 1.28-gallon flush provides significant water savings of up to 16,500 gallons per year, compared to 3.5-gallon toilets, without sacrificing performance. Pair this tank with the K-4309 bowl for a complete toilet. 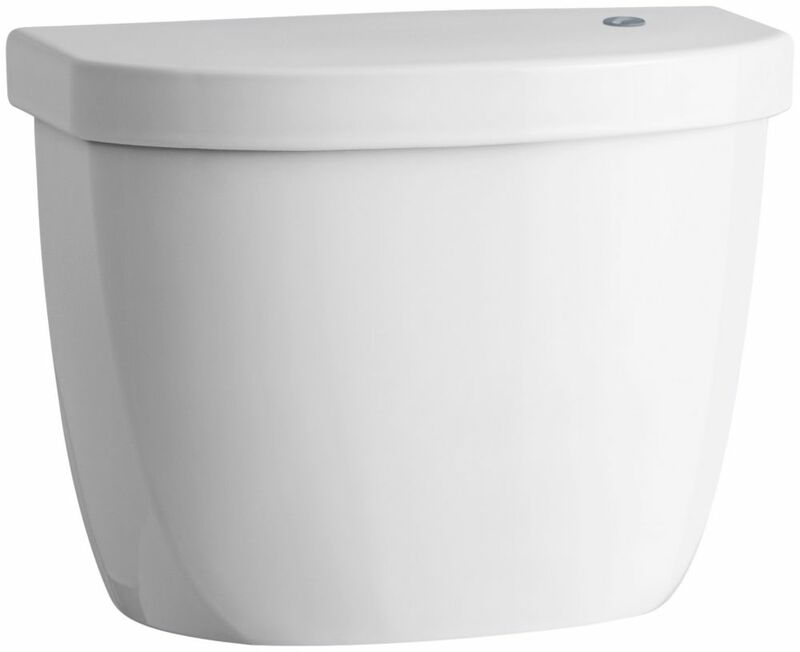 Combines with the K-4309 bowl to create a complete K-6418 Cimarron toilet. Pressure Lite toilets raise the bar for exceptional bulk flushing performance. When paired with a Highline toilet bowl, the durable construction of this Highline Pressure Lite toilet tank with left-hand trip lever and tank locks ensures years of reliability. Cimarron Touchless 1.28 Gpf Single Flush Toilet Tank Only In White The KOHLER touchless toilet is the no-touch flush for your home. Just hold your hand over the tank sensor to activate the flush. No handle to touch means fewer germs to pick up or leave behind. This Cimarron tank features innovative AquaPiston technology, a patented flush engine that delivers a fast, powerful, and virtually plug-free flush. Its 1.28-gallon flush provides significant water savings of up to 16,500 gallons per year, compared to 3.5-gallon toilets, without sacrificing performance. Pair this tank with the K-4309 bowl for a complete toilet. Cimarron Touchless 1.28 Gpf Single Flush Toilet Tank Only In White is rated 1.0 out of 5 by 4. Rated 1 out of 5 by Ladydree from I bought this toilet for my husband’s bathroom. He has Parkinson’s and I THOUGHT it would be a be... I bought this toilet for my husband’s bathroom. He has Parkinson’s and I THOUGHT it would be a better option since all he would have to do is wave his hand over the lid. WRONG! At first, it kept flushing. I took the lid off and found that water sprayed towards the sensor. I reduced the water flow. Helped a little, not as many ghost flushes. Then, that stopped working. Replaced the batteries thinking that might help. After a couple of months, it quit flushing altogether! Now, I just keep the lid and the water off. The toilet never shuts off and I have to pull up on the black thing to release water into the bowl and shut the water off after the tank fills up. What I thought would be a great idea has become a nightmare. Sad because I like and have other Koehler products in my home. Rated 1 out of 5 by Disappointeduser123 from What a piece of junk! Good concept but prone to failure. I have been dealing with ghost flushin... What a piece of junk! Good concept but prone to failure. I have been dealing with ghost flushing waking my family up in the middle of the night for 2 years now. Constantly replacing batteries and due to phantom flushes. No telling how much water we've wasted. Replaced the sensor after sending one back to manufacturer. Still malfunctions. I'm going to have to replace this tank with a lever flush. Not happy about the extra cost. Avoid this at all cost. You will be disappointed. Rated 1 out of 5 by HouseDoctor18 from We purchased a Kohler touchless toilet with this tank about 3-4 years ago. We have had continuou... We purchased a Kohler touchless toilet with this tank about 3-4 years ago. We have had continuous problems with it, and the sensor fails repeatedly. It got so frustrating that we just shut it off and have not used it for the past 2 months. I e-mailed Kohler, as the Kohler rep suggested in response to the preceding review, and have yet to hear anything from them. We are extremely dissatisfied and disappointed with the product and the lack of response from Kohler.